MUMBAI, INDIA - 8 JANUARY 2015: Man cleaning dead feathery animal in workshop in Mumbai. MUMBAI, INDIA - 8 JANUARY 2015: Man peeling off skin of slaughtered pig in workshop in Mumbai. MUMBAI, INDIA - 8 JANUARY 2015: Man putting chicken on a weighing scale in workshop in Mumbai. MUMBAI, INDIA - 8 JANUARY 2015: Man weighing chicken meat at market workshop in Mumbai. MUMBAI, INDIA - 12 JANUARY 2015: Men and boys working in a workshop in Mumbai. MUMBAI, INDIA - 12 JANUARY 2015: Men sewing clothes in a workshop in Mumbai. 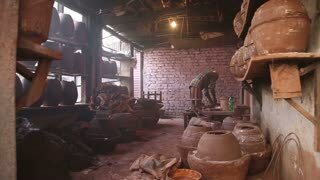 MUMBAI, INDIA - 12 JANUARY 2015: Indian men in clay workshop in Mumbai. 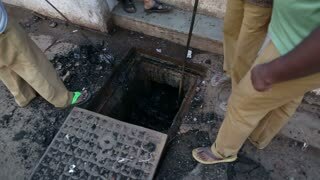 MUMBAI, INDIA - 12 JANUARY 2015: Men cleaning sewerage at street in Mumbai. MUMBAI, INDIA - 7 JANUARY 2015: Man chopping on a table of a workshop in Mumbai.